While most of the people with obesity problem suffer with fat accumulated all over the body, there are some people who just suffer with stomach or belly fat. Generally, crunches are one of the best exercises when it comes to reducing the fat around the belly region. But, some people with more stomach fat could not exercise. And there comes the alternative solutions like these home remedies. For any ideal body shape, it is necessary to follow a healthy and well-balanced eating habits. Therefore, it is advised to quit any unhealthy eating habits like the fast foods, high calorie snacks etc…if you’re seriously looking to shed excess pounds. One simple mistake can ruin your weight loss results. For example, a single cheeseburger and fries contain nearly 690 calories. But, in order to spend those 690 calories, you’ll need to exercise for 141 minutes (2.5 hours) on the elliptical. So, you can simply skip that cheeseburger and save those calories from being accumulated as your body fat. P.S: This homemade belly fat burning drink should not be taken while on the three day Military diet. You can have this during your regular diet plan i.e., after completing the military diet. Now, let us come to our magical drink recipe, which will help you lose excess stomach fat without having to perform any strenuous exercises. Just take a blender and put all the ingredients in it. Blend the ingredients until you get a nice mixture. Drink the juice immediately. If you follow this home remedy for at least a month, you’ll see a visible change (decrease) in the size of your belly. 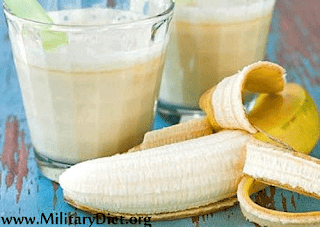 This delicious banana almond drink is aimed at burning the excess stomach fat extremely fast. Based on the studies, the resistant starch found in the Bananas has a positive effect on the body fat levels. It helps in easy digestion and also decreases the accumulation of the fat in the long term. The flax seeds contain fiber and omega-3 fatty acids, which is a very powerful combination and a gift to those who’re trying to melt their stomach fat or lose weight quickly. They contain polyunsaturated fat, which is best for fat loss. Flaxseeds are also low in calories and carbs. The Almond milk is low in calories when compared to the skim milk and so is ideal for weight loss. For example, a cup of Almond milk contains 39 calories, while the same cup of skim milk has nearly 91 calories. But, remember to drink it unsweetened or else you may be increasing the number of calories. It is also rich in Vitamins like E, D, A and Calcium. Since, the almond milk contains only 8 g of carbs, it is good for the diabetic patients and those who suffer with blood sugar problems. Yogurt is a good source of Calcium and according to a study by the American Diabetic Association, taking adequate amounts of Calcium lead to a healthy BMI and reduced amount of body fat in several people. And for centuries, Yogurt is found to be very effective in solving the digestive problems. However, it is recommended to choose only the low fat, plain, unsweetened Yogurt if you’re trying to lose weight. Coconut Oil contains a unique combination of fatty acids that are proven to be more powerful in improving the metabolism of a person. Many studies have proven that adding the coconut oil to your diet helps in losing the dangerous fat that is accumulated in the abdominal cavity. It reduces the appetite and thus make you eat less without trying. Honey is one of the nature’s gifts and is the best alternative to sugar. However, do remember to choose only the organic honey, as the honey found in the market contains preservatives and high fructose corn syrup, which is 100% unhealthy. If you don’t like to add Honey, you may add the Stevia. Overall, there are many advantages of having this magical drink to lose belly fat without exercising. Previous Post:How to Balance Hormones and Lose Weight Fast?